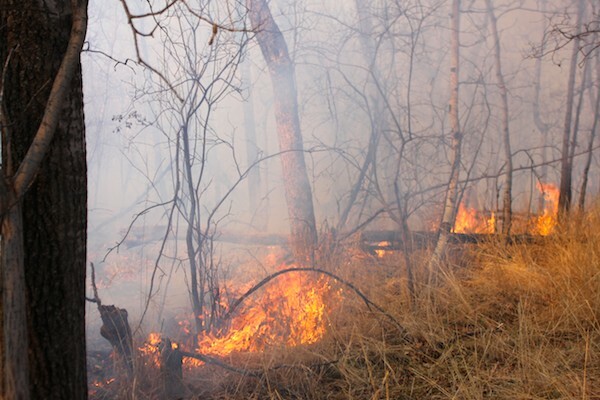 The location of a grass fire in Assiniboine Forest Thursday afternoon worked against firefighters as they fought to bring in water. The fire broke out at around 12:30 p.m., sending plumes of smoke over Charleswood. Firefighters had to drag hoses for several hundred metres after stationing themselves on Shaftesbury Boulevard and attaching hoses to residential fire hydrants. At least seven fire trucks responded to the blaze, which was quickly spreading closer to the road near where Shaftesbury meets the western edge of Taylor Avenue. Winnipeg police closed Shaftesbury between Wilkes and Grant Avenues so firefighters could get a handle on the flames. The fire was mostly under control by around 5 p.m., but crews remained to put out hotspots. A cause hasn’t yet been determined, but dry conditions in the city have been contributing to a number of similar fires in recent weeks.